Artist's illustration of a sail-equipped, laser-propelled "wafersat" designed to explore the solar system and beyond. All of the books ever written, the genetic blueprint for human life and much of the other information that defines us as a species could soon be riding laser beams toward faraway exoplanets. A new project called "Voices of Humanity" aims to send all of this stuff and more out into the "cosmic cloud," just in case something terrible happens to us here on Earth. 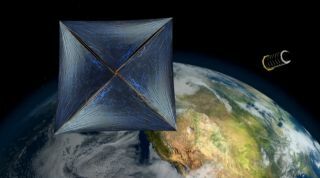 This isn't Lubin's first space-laser rodeo; he's also a key player in Breakthrough Starshot, a $100 million initiative that aims to develop the ability to laser-launch tiny, sail-equipped "wafercraft" to Alpha Centauri and other extrasolar systems. Lubin has also received two rounds of funding from the NASA Innovative Advanced Concepts (NIAC) program to develop this laser propulsion technology. Voices of Humanity is a different but related effort, and one that doesn't have solid financial backing yet. Indeed, Lubin, co-founder Travis Brashears (a physics undergraduate at the University of California, Berkeley) and their colleagues are looking to the masses for funding, via a Kickstarter campaign that launched today (July 18). The Voices of Humanity team initially hopes to raise $30,000. This money will be used to launch a "humanity chip" full of images and other data provided by Kickstarter contributors to low-Earth orbit, likely in mid-2017, project team members said. If the Kickstarter campaign hits its $100,000 "stretch goal," the researchers will build a ground-based laser system that will beam digitally encoded information directly to the objects of campaign contributors' choice — stars or exoplanets, for example, or even (for particularly dark thoughts) the supermassive black hole at the Milky Way's core. The laser-beaming system could be built within 12 months if the team reaches the $100,000 stretch funding goal, Brashears told Space.com. "The Voices of Humanity campaign’s purpose is to give a voice to all of humanity and to immortalize those voices. In this way, your voice will literally live forever," the project's Kickstarter site reads. Over the long haul, Lubin envisions such space-based time capsules as being part of a cosmic ark that preserves humanity and its culture, via information-carrying chips as well as directly beamed data. Schematic depicting a "wafersat," which researchers hope to outfit with information containing "humanity chips" and send out through the cosmos via laser propulsion. The humanity chips — whose memory capacity the team aims to increase every year — would ideally not just ride aboard tiny, laser-propelled craft. Lubin said the team hopes one chip can hitch a ride on pretty much every future space mission. The mass of each chip will be just 1 gram (0.04 ounces), so adding one to a satellite or interplanetary probe wouldn't be a burden, Lubin said. Such chips could carry the entire contents of the Library of Congress, a video message from everyone on Earth or virtually any other type of data. "Personally, I would like to send out a blueprint for life on Earth and how to reconstruct us, how to make us," said Lubin, who has also formed a company called Directed Energy to help pursue such goals. "Everything required to have a do-it-yourself 'build humanity' project." Not everyone is in favor of beaming information about ourselves into the cosmos. For example, the famed astrophysicist Stephen Hawking has warned that intelligent aliens could theoretically use this information to conquer humanity and pilfer Earth's resources. But Lubin noted — as others have — that humanity has been broadcasting data into space since the invention of the radio a century ago. So Voices of Humanity and related efforts wouldn't really increase the risk, he said. "If they want to come and eat us, presumably they already know that we're here," Lubin said. "People are used to being afraid of the dark from when they were children. We want to explore the universe — not be afraid of it." You can learn more about Voices of Humanity and participate in the Kickstarter campaign here: https://www.kickstarter.com/projects/1793003507/voices-of-humanity-the-worlds-space-time-capsule.